Winner of 4 Oscars, including Best Actor. 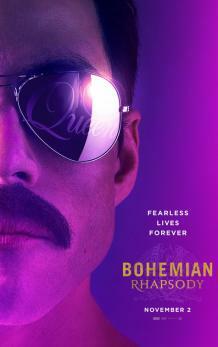 “Much of the emphasis in Bryan Singer's Queen biopic is on late frontman Mercury, played by a resplendent Rami Malek, fake buck teeth and all. His fellow band members get some screen time too: guitarist Brian May (Gwilym Lee), drummer Roger Taylor (Ben Hardy) and bassist John Deacon (Joseph Mazzello).